Since the mid 80ies it is believed that the Chicxulub crater (Yucatec-Maya, pronounce: “Tsheekshulub”) shows the evidence for the extinction of the dinosaurs. 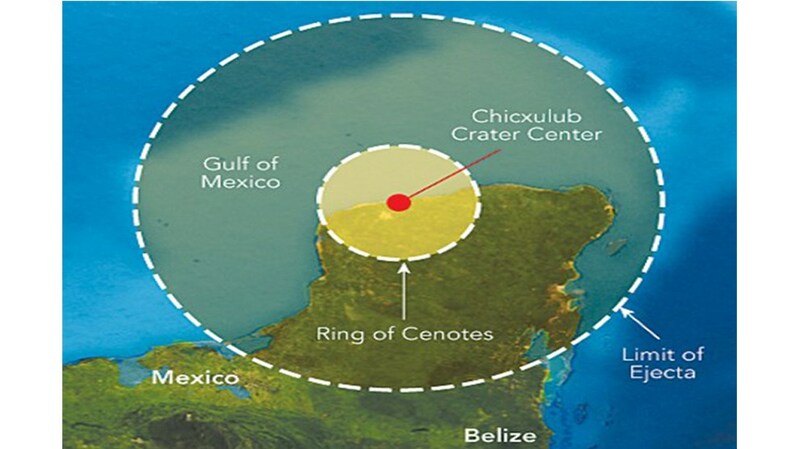 The crater off the coast of the Yucatan Peninsula was formed through the impact of a meteor at the end of the cretaceous period (65mio years ago). The surface area of the flat northern part of the Yucatan Peninsula shows little of the third biggest of all impact craters on earth. However, drilling analysis prove that small elevations of the ground form almost round structures around the impact center and the thickness of the deposition also varies accordingly. Additionally, many typical cenotes can be found in a distance of 83 km from the center in a concentric way like pearls on a necklace. The impact area was at that time still a shallow ocean, where thanks to coral growth and depositions (of so called foraminifera) a limestone layer has formed that measures in some areas over 2.5 km of thickness. When the meteor hit the ground, it also broke the limestone plateau open, fracturing it in a star like way away from the impact crater of the meteor. As a result of the huge amount of dust in the air, there was a climate change (loss of vegetation leads to excinction of plant eating animals, leads to exctinction of predators). Also precipitation mixed with CO2 and formed so called acid rain and slowly penetrated into the limestone and dissolved the soft stone so that channels and subterranean riversystems formed over a long period of time. Due to the marine history of the stone, there are many marine fossils to be found in the walls of the caves. But there is another interconnection between various factors that favoured the creation of the caves: the sea level had to be much lower than today, that on the one side, there was a flow of fresh water towards the ocean dissolving much faster the limestone and the seeping of the water was possible and therefore forming the stalactites and stalagmites by a constant dripping in these formerly dry caves. These speleothems can be found primarily in the shallow parts of the cave as they lay dry over a longer period of time. These unique combination of factors created the Underworld Cave Systems of the Yucatan Peninsula and many of the longest caves systems in the world are found in the Riviera Maya. The actual Cenote (derived from the Maya word “dzenot”) is the collapse of the roof that became too thin or was not supported by water anymore. Different cenotes have complete different characteristics, as we can find small holes or huge craters. As well as the innerspace of the cave system can have tight passages and huge rooms.